The only way these cars could be better is without a roof! 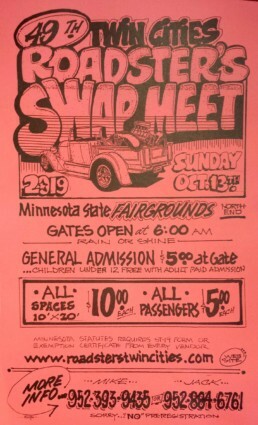 Every October, TCR holds it’s annual swap meet at the Minnesota State Fair Grounds. Growing every year, the swap meet manages to bring out over 500 vendors. Learn More. Every year we give out the prestigious Silver Hacksaw Award to one lucky recipient that we believe has an outstanding car, with one flaw. It still has it’s roof. Time to get cutting. Learn More. Members of the Twin Cities Roadsters don’t just let our roadsters sit – We drive ’em! Check out some of the fun we’ve had over the years. Gallery Page. Thank you for visiting the Roadsters/Twin Cities web site - One of the premier Roadster clubs in North America. 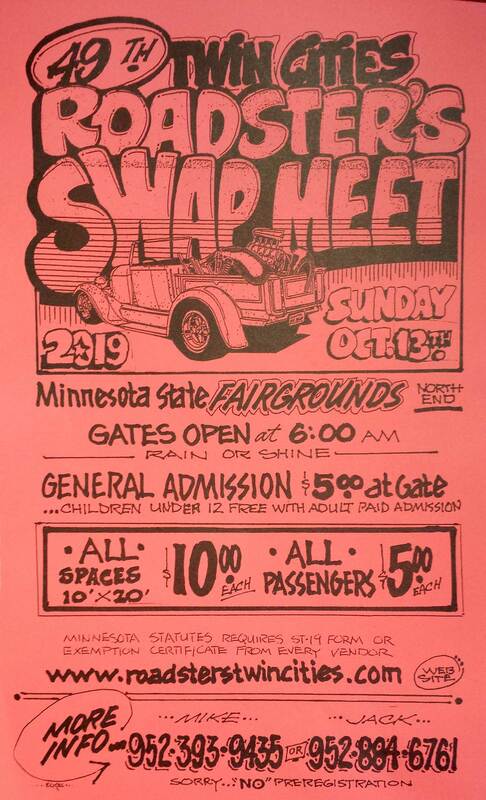 Again this year we will be hosting our annual October swap meet. Contact us if you have any questions. As always, it should be a great event – hope to see you all there!